Baldwin has a 60 year legacy of craftsmanship and innovation. Rated #1 in quality by builders and contractors, Baldwin is pleased to offer a line of luxury hardware for the discriminating consumer, our Prestige Series. Feel the difference - Baldwin hardware is solid throughout. With a 60 year legacy of superior style and quality, Baldwin is the choice for an elegant and secure presence. The classic round shape and intricate lines of the Alcott knob complement and enhance a variety of design styles. The Polished Brass finish adds to the traditional look and feel of the product and makes a classic statement. This privacy knob/lever is best used in interior bed and bath applications where privacy is required. Both knobs/levers are locked or unlocked by turn button inside. The outside knob/lever can be unlocked by an emergency key. Prestige Alcott Polished Brass Bed/Bath Knob Baldwin has a 60 year legacy of craftsmanship and innovation. Rated #1 in quality by builders and contractors, Baldwin is pleased to offer a line of luxury hardware for the discriminating consumer, our Prestige Series. Feel the difference - Baldwin hardware is solid throughout. With a 60 year legacy of superior style and quality, Baldwin is the choice for an elegant and secure presence. The classic round shape and intricate lines of the Alcott knob complement and enhance a variety of design styles. The Polished Brass finish adds to the traditional look and feel of the product and makes a classic statement. This privacy knob/lever is best used in interior bed and bath applications where privacy is required. Both knobs/levers are locked or unlocked by turn button inside. The outside knob/lever can be unlocked by an emergency key. Prestige Alcott Polished Brass Bed/Bath Knob is rated 4.9 out of 5 by 8. Rated 5 out of 5 by Will from This knob is much heavier than most, feels solid in... This knob is much heavier than most, feels solid in the hand, and operates smoothly It’s not a cosmetic match to the 1930s solid door hardware in my home, but it doesn’t feel cheap like it’s predecessor. Rated 5 out of 5 by Roy from Great quality at a reasonable price.... Great quality at a reasonable price. Rated 5 out of 5 by Sandra from The knob sets are first class. I ordered 3 locking... The knob sets are first class. I ordered 3 locking sets and 3 non-locking sets. They look fabulous in my home. They were delivered on time. I am very pleased with the ordering and the product. My older doors had to be drilled a bit to fit the new knobs, but that was not a problem for the installer. Rated 5 out of 5 by Al from These are the most solid door knobs on the market.... These are the most solid door knobs on the market. Like everything you get what you pay for and these are worth the extra expense. Rated 4 out of 5 by specs from These are nice doorknobs, but we were annoyed that one arrived without a part; I had to schlepp t... These are nice doorknobs, but we were annoyed that one arrived without a part; I had to schlepp to the store, return then re-order. I also found the tape around the handle difficult to remove and now I have residue that doesn't want to come off. Otherwise, they are fine. Rated 5 out of 5 by Illuminated from An A Plus Quality Lock With an F Minus Installation Technical Documentation Issue! Bought the subject Prestige Series lockset today to replace one that (rare for a Baldwin) had failed due a broken latch activation mechanism. 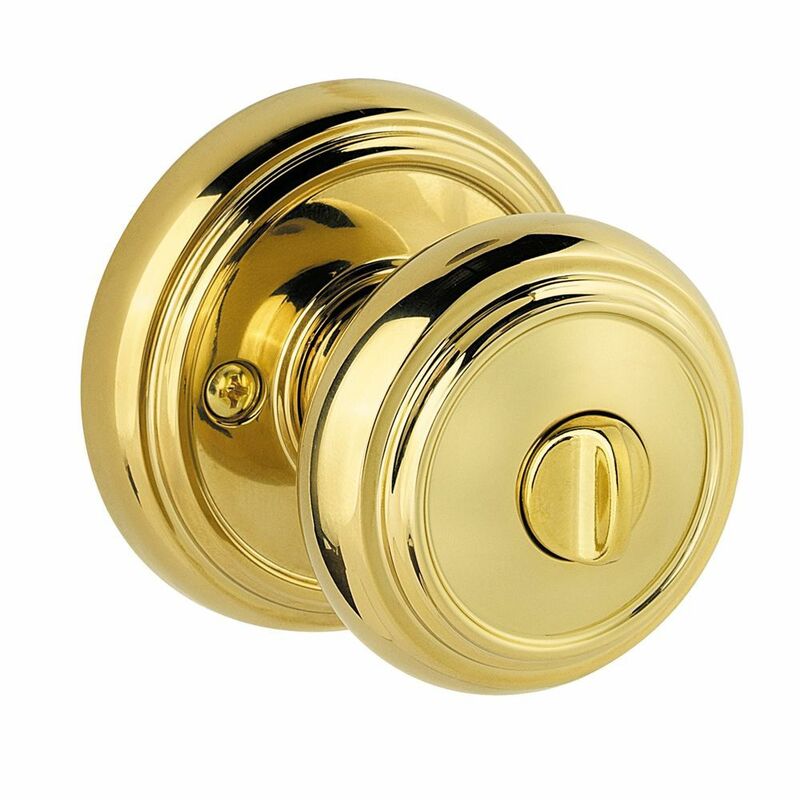 We have been using the solid brass Baldwins over the cheaper brass plated Schlage and Kwiksets for many years because of their quality solid feel, and because the finish will never wear off. All went well with the install (I have removed/replaced/repaired/installed many locksets over my 61 years) until I went to finish up the job by putting the knobs on the shafts. To quote the instructions - "Place lever or knob on assembly and tighten setscrew to secure. Repeat for the knob or lever on the other side". These words were accompanied by the usual picture of an allen screw being rotated to tighten it on the knob shaft with the (supplied) allen wrench.. Easy enough, right? Just like every other knob with an allen headed set screw you have ever worked on in your life, right? WRONG!!!!! At first i noticed that there were no set screws in the knobs, and there were certainly none in the bag of hardware that came in the box. I assumed that for some reason this lockset somehow was shipped without the setscrews being installed in the knobs (in over fifty years of working on radio and electronic equipment, and door knobs as well (including all our previous Baldwins), I have never seen a knob that was sold without the setscrew already installed in it. So I totally took apart the already installed lockset, packed it up and headed back to our local Home Depot to get a replacement lockset on exchange. However (after getting drenched in the pouring rain we had today on the way over to the store) it turned out all of the remaining locksets in stock also appeared to be missing their knob setscrews, Furthermore, upon close inspection of the knobs, their setscrew holes were not threaded! What the heck? Finally, after puzzling over this enigma with the guy at the service desk for about twenty minutes, we figured out that the set screws were indeed there - they were screwed flush into the shafts that the knobs attach to. After nearly breaking the little allen wrench trying to remove the screws by doing the usual lefty-loosely counterclockwise rotation, and puzzling as to why they were in the shafts on the first place,we figured out that the setscrews were REVERSE THREADED, and had to be turned CLOCKWISE to come up out of the shaft. The way the design works (which is totally counter-intuitive to anyone who has ever put a knob on a shaft before) is that the knob is placed on the shaft so the setscrew hole lines up over the flush setscrew in the shaft, and then the setscrew is then raised up into the hole of the knob to secure it from rotating on the shaft. There apparently is a taper to the hole in the knob so the setscrew "tops out" (as opposed to bottoms out) as it is raised up into the hole which keeps the knob tightly secured, and prevents losing the setscrew by backing it all the way out of the knob. An effective, and elegant design - but it is so counter-intuitive and literally 180 out from a conventional knob and setscrew design it needs to be thoroughly explained in the installation instructions. I wasted a whole lot of time figuring something that normally is very simple out. Who has ever previously put the setscrew in the shaft vs. the knob, and then to further frustrate the purchaser, used a reverse-threaded setscrew that has to be turned CLOCKWISE to remove it from the shaft? Arrgh! I would not be surprised that there have been many others having the same problems I did. I recommended that the hardware manager at the local Home Depot make up a little "heads up" info sheet and attach them to the product boxes to make up for the woefully inadequate instructions supplied by Baldwin. Baldwin should be revising their instruction sheets and doing something similar for those products with this design already shipped. Rated 5 out of 5 by TADC from Superior quality that you can feel right out of the box. Really solid product. Beautiful. Replaced most of the bedroom and bath doors in the house with it. Workmen complimented the product. Solid zinc (as opposed to brass for their more expensive lines).